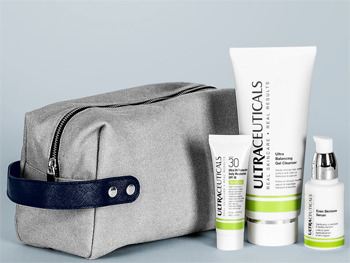 Ultraceuticals Australia celebrates with dads around the country with the release of the ultimate men's gift pack which includes a stylish travel toiletry bag priced at $165 and a value of $187. Men's skin is usually thicker, with larger pores producing more sebum and often resulting in an oily complexion. Despite increased sebum, the thicker epidermis also requires more hydration and exfoliation as layers of dead skin cells build up, even resulting in areas of dryness. With the Ultra For Men skincare pack it's as easy as 1, 2, 3 to cleanse, treat and protect to keep your skin in the best shape possible with minimal fuss. Ultraceuticals salon partner, Face of Man Grooming Lounge says: 'Men these days want to look younger and fresher and have taken the time to educate themselves on the best way to do so. The majority of our clients request face peels because they are here for a result." It's not surprising that the most common skin concern they treat for men is sun related damage. What do they find the top 3 skin care mistakes men make? Not wearing sunscreen on a daily basis. Some men still associate sunscreen with being thick, heavy and greasy on the skin. Ultraceuticals have a great range of sun care that is mattifying and non-greasy. Not using a lighter, hydrating lotion over a heavier moisturiser if they have oily skin. Over scrubbing their skin. Men love to use scrubs and harshly too. They understand they need to exfoliate but they can take it to extremes.